The Earth’s Mightiest heroes assemble on May 19th for the inaugural, first-annual, Avengers Day! This historic event marks an all new era for Marvel’s greatest heroes as the Avengers come together to usher in The Heroic Age. Mark your calendars and be the first person on your block to score great Avengers Day commemorative items like exclusive limited edition print featuring John Romita Jr.’s “I Am An Avenger” images, door hangers, mini-posters and more! Plus, fans can’t miss the chance to add their own heroes to the Avengers roster by sketching on the Avengers #1 I Am An Avenger Blank Variant! In-case you missed him on Free Comic Book Day, or if you’re like us and you just can’t get enough of his AWESOME art, Vince Sunico will be on hand from 11am to sketch your favorite characters on the Avengers #1 I Am An Avenger Blank Variant! 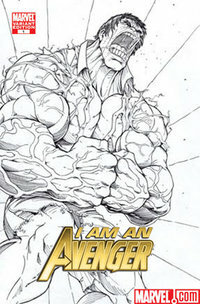 John Romita Jr. “I Am An Avenger” Limited Edition Print for the first 25 people to come in and buy a copy of Avengers #1! $1 BACK ISSUES – There will be a huge selection of Avengers back issue comics on sale, you’ll be able to find issues from Avengers (All Volumes), Mighty Avengers, New Avengers, Avengers Initiative, West Cost Avengers, Dark Avengers and more! We probably haven’t pulled most of these issues out of the basement for about 3 years!! + Selected Avengers Hardcovers and Paperbacks only $9.99 EACH! + Selected Avengers Hardcovers and Paperbacks 25% OFF! Vince’s Beserker Wolverine eBay auction ENDS tomorrow!